Antonio's Coney Island & Central American Food: Everything is worth a taste — The Butters Hygienics Co. I've seen Antonio's Coney Island nestled next to Norton's flower shop on Washtenaw for a while but never bothered to go in. As I sit in their citrus colored dining room waiting for my food, I realize I've made a terrible mistake. 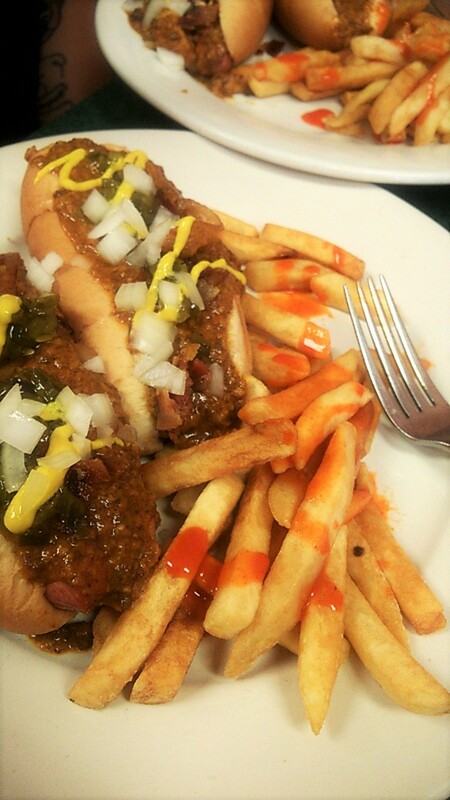 At It's heart Antonio's is your typical Coney Island, chili dogs and all. Whole there's a lot to love there, that's incredibly easy to find around here. Where Antonio's stands out, though, is in its inclusion of Central American foods in it's already extensive menu. During my visit, I ordered baleadas, stuffed plantains (plantano rito relleno), and the Coney supreme meal. Baleadas, which I'd never had before, are grilled flour tortillas filled with red beans, cheese and cream. It's like a mash up between a burrito and a quesadilla, which ends up more delicious than both. Their stuffed plantains are deep fried, sliced in half and filled with red beans and cream. The savory and sweet variations on beans and cream in both are really good. I'm not a beans person, in general, but I will definitely order both again. All together, my bill came too $17 plus tax and tip for 2 people - my partner ordered another Coney supreme for himself. Speaking of which, those are classicConeys with bacon & relish plus fries for $6. That's a solid deal. The only problem I have with them is that their flan, which looked amazing, cost an extra $4 and I'm on a budget. Then again, dessert costs far too much for me at literally every restaurant. So, it's not like Antonio's is being unreasonable, I'm just unreasonably broke.